- Paragraphic EQ: Shape the tone with eight nodes of bell, highpass, lowpass, highshelf or lowshelf filters overlaid on an ultra fast spectrum display. - Multiband Harmonic Exciter: Up to four bands of multiband excitation for adding warmth, sparkle or shine to your mixes. - Multiband Stereo Imaging: Up to four bands of multiband stereo widening for adding space to your mix without losing the bass. - Mastering Reverb: Dual mode reverb for adding ambience to your mix. - Loudness Maximizer: Push the level without overloading with analog modeled or digital transparent loudness maximizers. - Dither: Prepare audio for CD with word-length reduction and high order psychoacoustic shaped dither. This new mode for the Dynamics module intelligently automates the difficult task of finding the right release times. The compressor actually responds to the audio in real time, adjusting the release values based on the transient properties of the incoming signal. Without Adaptive Release, you’d have to pick an average release value to service both transients and sustained signals—or do twice the work! Adaptive Release does the hard work for you transparently, so you can dive right into the creative aspects of mastering without a frustrating learning curve. Vacuum tubes have long been praised for their ability to add color and character to cold, sterile, and flat-sounding recordings. The Tube Limiting mode for the Maximizer module combines warmer, more analog-sounding final stage limiting with the ease and precision of digital maximizing. The resulting audio has a tube warmth while remaining competitively loud and appropriate for modern mastering. With a new algorithm inspired by tube hardware limiters like the Fairchild 670, the Tube Limiter blends the best of digital and analog, adding a vintage sonic character to Ozone’s maximizing algorithm. For Ozone 6.1, we brought back Module Presets, so it's now easy to creatively experiment with different module combinations. You can load and save settings for individual modules without affecting the settings of other modules. The Module Preset system’s simplified interface is more conducive to working with individual modules. Save your settings to instantly load up on your next track or project. Get confidence from using professionally designed presets while still retaining creative control over your signal chain. The new update includes a number of other additions and enhancements to help streamline your workflow and offer a richer user experience. You can select and loop regions in the Waveform Segmentation Overlay, export files with automatic track numbering for better organization, and more. Ozone 6 features the largest user-interface overhaul in iZotope history. We’ve created an elegant and striking visual aesthetic that guides users through every stage of the mastering process. 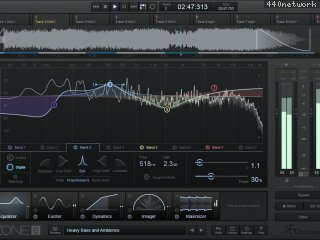 Alongside a fluid workflow, the creative elements of mastering are now front and center, so users can define their own sound with ease. Fixed intermittent crash in Pro Tools 11 on Windows 64-bit systems. Fixed crash on Windows related to Fonts. Fixed unresponsive Authorization Wizard when opening Pro Tools 11 sessions that include a demo of Ozone or Insight. Fixed a 64 bit AAX bug where some list items wouldn't stay selected. For example, if trying to select IRC II in the Maximizer, the selection would skip back to IRC I. Please note: This update no longer supports 32-bit AAX. Customers accustomed to using 32-bit AAX in Pro Tools 10 can instead use the RTAS plug-in format without any degradation in audio quality. For your convenience, any session saved with the 32-bit AAX version of Ozone will automatically open with RTAS. What's New in Ozone 5? Pristine Sound and Enhanced DSP - Each module has been updated with refined signal processing algorithms to bring you a new level of mastering quality. The most complete mastering suite available has never sounded better. Optimized Workflow and Updated Interface - iZotope has redesigned Ozone's user interface to allow for finer control while placing important features right at your fingertips. New users can jump in without a steep learning curve while experienced Ozone fans will feel right at home. Visual Feedback - Every module features updated metering to help guide you to the perfect-sounding master. Ozone 5 Advanced builds on iZotope's reputation for superior sound quality and industry-standard audio mastering tools. Each module in Ozone 5 Advanced is equipped with extended features made specifically for mixing and mastering professionals. For added flexibility, Ozone 5 Advanced allows customers to use each of the mastering modules as individual plug-ins. Combining essential visualization from Ozone's modules with new metering tools, the all-new Meter Bridge provides a suite of audio analysis tools that help you visualize changes made during the mastering process, troubleshoot problematic mixes, and compare reference tracks. Extended Features - Ozone 5 Advanced provides deeper control within every module in Ozone. Advanced exclusives include a variable-phase EQ, Loudness Maximizer modes with Transient Recovery and Stereo Link controls, mono-compatible stereo synthesis features and much more. Meter Bridge - The powerful Meter Bridge introduces a high resolution real-time 3D spectrogram with unique mix analysis features, BS.1770-2 compatible stereo loudness metering, resizable spectrum analyzer, and a vectorscope with stereo balance and correlation meters. 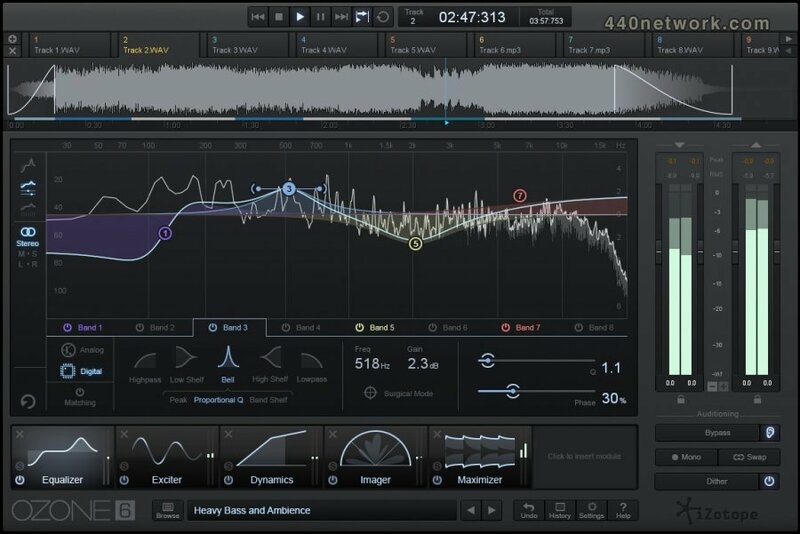 Meter Taps - For mixing and stem mastering, multiple audio streams can be superimposed on a 2D or 3D plot using Ozone 5 Advanced's Meter Tap plug-ins. Meter Taps enable unprecedented visualization of how a mix's elements fit together. Component Plug-ins – Use Ozone 5 Advanced's mastering modules as an integrated mastering system or as individual plug-ins. Move module presets between Ozone 5 Advanced and its components freely. * Added Brightness control under General Options. You can use this to improve the legibility of the Ozone 4 user interface if it is hard to read on your monitor. * Improved CPU usage for Room Reverb mode. New Room Reverb Buffers option in the EQ/Reverb/Crossover tab of options menu. * Selectable metering source—choose between stereo and mid-side meters. The 3.10 update improves processor performance, especially in Pro Tools. Version 3.06 addresses an issue with the Logic 7 Audio Unit validator.